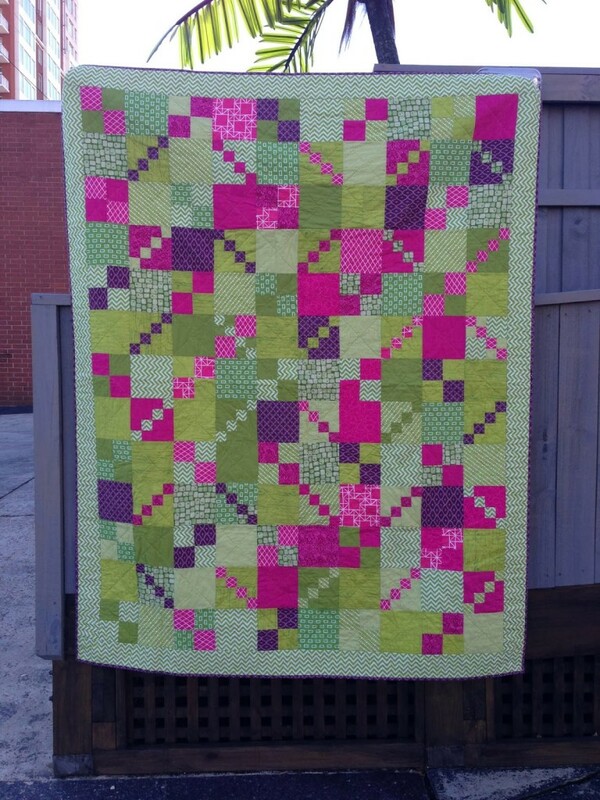 I noticed this quilt on the blog, Fist Full of Fabric, and thought the combination of greens, pinks and purples was interesting. Look closely and you’ll see a range of light to medium greens, medium and dark pinks and dark purples. I think it has potential for a future lotto block … what do you think? When we talk about color palettes, sometimes a photo really is worth more than a simple text description. Last month, as part of the fabric giveaway, I asked for suggestions for color combinations for future lotto blocks and you answered. Only a couple of you offered a link or posted about your color ideas. Because color names can be (and regularly ARE) interpreted by each of us, I thought it would be interesting to talk about color with examples. This might be a good month to play with a color palette generator. Julie commented on a sunrise photo on my blog, suggesting it as a color idea and I wondered what would happen if I ran it through a color palette generator. Use this link to read a review of Five Amazing Color Palette Generators. I used Color Hunter on my sunrise photo. I wish it had included the yellow I see in the photo, but it’s still interesting, I think. If you’d like some color combinations to consider, or a jumping off point, here are your suggestions to me in the comments last week. Do you think everyone who suggested “blue and yellow” were seeing the same thing in their mind’s eye. These suggestions definitely will have an impact on future lotto blocks, I already have some ideas, but because I know what I “see” when I read them may not be what you intended, I’d love to see what you see and collect images that can be used as color inspiration in future months. Remember, you don’t have to have your own blog to join the party. You can create a blog post here (use the category block lotto community) and link it or link to your image on Flickr or another photo sharing site. If you link to a photo, be sure to include a description to make your suggestion perfectly clear. Honestly, there is almost no color I won’t use, but I really don’t like the “rustic”/country quilt look or Civil War colors as I find them dull and uninspiring. I LOVE the idea of a monochromatic block.